As the name suggest, the raw food diet is a diet based around food that can be eaten raw. The diet is therefore predominantly based on vegetables, fruit and legumes. The diet is believed to help people find health when they are struggling to get healthy by eating a normal Western diet. Raw food diets by their nature include less trans fats and additives, will be lower in saturated fat and will often be less calorific than Western diets. How does a raw food diet help? The following health benefits have been reported by people using a raw food diet. What is in a raw food diet? The diet is largely based on raw vegetables, fruit and legumes. Depending on how strictly the diet is followed, the diet may also be supplemented by a smaller proportion of cooked food. The diet is low in sodium, but it is high in potassium, magnesium, folate, fibre as well as health-promoting plant chemicals called phytochemicals. Phytochemicals are naturally occurring micro-nutrients in food. There are a large number of phytonutrients and the list includes carotenes, flavonoids and plant sterols. So a raw food diet helps to reduce diabetes risk? Whilst, research has yet to conclusively prove it, a raw food diet is thought to be helpful in lowering risk of diseases including heart disease, cancer and diabetes. 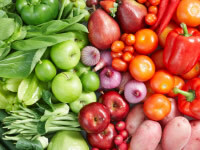 The ideas behind a raw food diet are that cooking and processing may remove a number of the helpful phytonutrients and that the diet helps to largely avoid man made food additives. What foods are typically included in a raw food diet? So I can’t cook anything with a raw food diet? Do I need special equipment for a raw food diet? How will a raw food diet make me feel? What should I be aware of when eating a raw food diet? A raw food diet may be deficient in certain nutrients and questions have been raised about increased susceptibility to food poisoning on a raw food diet. What nutrient deficiencies may result from a raw food diet? The following deficiencies may be observed from following a raw food diet. The raw food diet may therefore not be appropriate for certain types of people such as younger children, pregnant women and people with anaemia.